The General Osteopathic Council (GOsC) was established by the Osteopaths Act 1993 to ‘provide for the regulation of the profession of osteopathy’. The Osteopathic Practice Standards sets out the standards that practising osteopaths must meet. These include knowledge of the safe and competent practice of osteopathy, professional ethics and after-care evaluation. The practice of osteopathy has a long history in the United Kingdom. The first school of osteopathy was established in London in 1917 by John Martin Littlejohn a pupil of A.T. Still, who had been Dean of The Chicago College of Osteopathic Medicine. After many years of existing outside the mainstream of health care provision, the osteopathic profession in the UK was accorded formal recognition by Parliament in 1993 by the Osteopaths Act.This legislation now provides the profession of osteopathy the same legal framework of statutory self-regulation as other healthcare professions such as medicine and dentistry. This Act provides for "protection of title" A person who, whether expressly or implicitly describes him - or her- self as an osteopath, osteopathic practitioner, osteopathic physician, osteopathist, osteotherapist, or any kind of osteopath is guilty of an offence unless they are registered as an osteopath. There are currently more than five thousand osteopaths registered in the UK. Osteopathic medicine is regulated by the General Osteopathic Council, (GOsC) under the terms of the Osteopaths Act 1993 and statement from the GMC. Practising osteopaths will usually have a B.S. or M.Sc. in osteopathy. Osteopathy is a way of detecting, treating and preventing health problems by moving, stretching and massaging a person's muscles and joints. 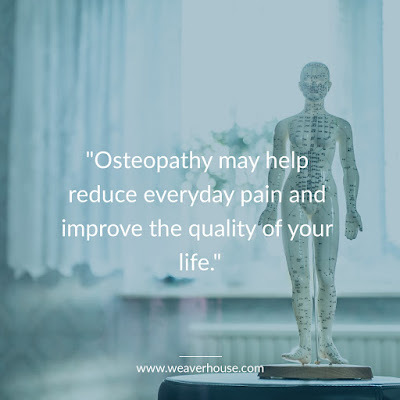 Osteopathy is based on the principle that the wellbeing of an individual depends on their bones, muscles, ligaments and connective tissue functioning smoothly together. Osteopaths use physical manipulation, stretching and massage with the aim of: increasing the mobility of joints, relieving muscle tension, enhancing the blood supply to tissues and helping the body to heal. This week for National Mens Health week we are encouraging men to try something new and investigate better ways to prevent and manage sports injuries, occupational injuries or any other niggling muscle or joint pains they may have. When you think of Osteopathy, do you immediately think of bones? We treat more than you think. We are primary healthcare practitioners who can help identify important types of dysfunction in your body. We focus on how your skeleton, joints, muscles, nerves and circulation work together to improve your health and well-being. Osteopathic treatment covers a diverse range of techniques such as stretching and soft tissue massage for general treatment of muscles, tendons and ligaments; along with exercise prescription and mobilisation of specific joints and soft tissues. Common conditions that men seek help from their osteopath for include neck pain, sports injuries, headaches and migraines, whiplash, postural problems, sciatica, knee and heel pain, shin splints, arthritis and occupational injuries. In Men's Health Week, now is the perfect time to find out more about how osteopathy can help you – and you don’t need a referral. Neuropathy can result from poor blood glucose control and damage to the nerves in your feet. This causes a loss of protective sensation meaning your feet may be unable to detect injury. For example, you may not be aware of an ulcer on the bottom of your foot as you do not feel any pain. This can then lead to more serious foot complications like infection if not treated. Symptoms of neuropathy can include numbness, tingling, pins and needles or a burning sensation in the feet. Poor blood glucose control may also cause a reduction in the blood supply to the feet. Poor circulation delays healing and makes people with diabetes more susceptible to infection following any cut or wound to the foot. Symptoms of poor blood supply may include cold feet, cramps and pain. People who suffer from diabetes should see a podiatrist as soon as they are diagnosed. An initial diabetes foot check will help determine how often you should visit a podiatrist for diabetic foot care and prevention of any related problems. Remember your feet are more at risk with diabetes and prevention is the best cure.